Photograph collection of webmaster D5080 provides assistance to E3113 and its train at Harrow & Wealdstone on September 16th 1966. The sixteen year seven month career of D5080/24080 was spent entirely on the London Midland Region apart from its very brief (paper only?) allocation to the Eastern Region. Circular gauge added to fuel & water tanks (during 1967 repair). Boiler water tank removed permanently (mid 1970s modification). April 1960 to Rugby (2A) on loan. September 22nd 1976 - withdrawn. 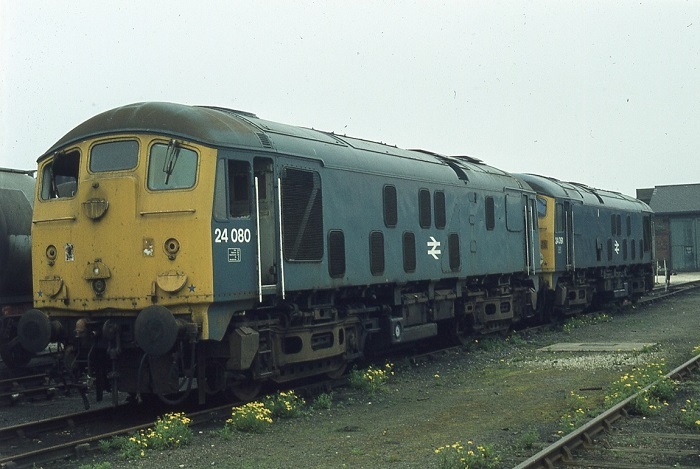 After withdrawal 24080 was stored at Crewe until May 11th 1978 when it was moved to Doncaster Works, where it was scrapped by the middle of June 1978. Movement: 24036/57/80/91 12.30 Crewe - Doncaster via Derby May 11th 1978 (layover at Derby), powered by a Class 47. Photograph collection of webmaster Withdrawn 24080 & 24091 appear to have just arrived in Doncaster Works, suggesting the date is May or June 1978. Noted Derby Works June, September & December 1960. Noted Crewe Works September 1961. Noted Derby Works March & August 1962. Noted Derby Works June & July 1967 (received blue & yellow livery). 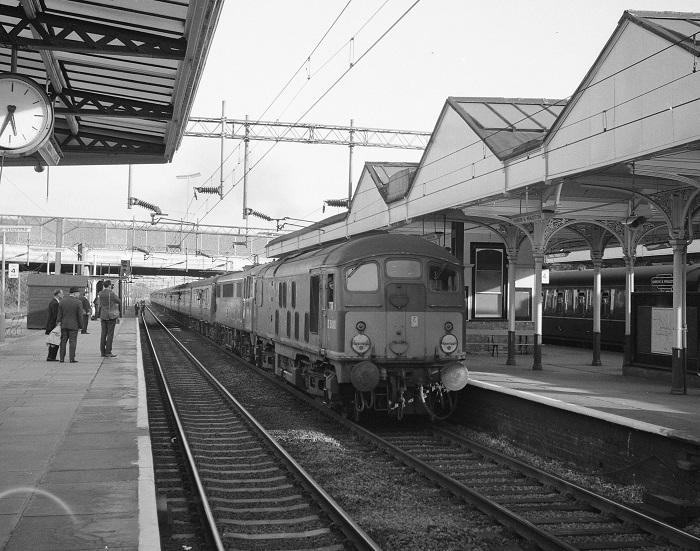 From April 11th a Type 2 was rostered for the 7.53am Norwich - Birmingham and 3.55pm return, a working once familiar to 10800 (retired August 1959), on April 12th D5080 was noted on this run. D5080 was a frequent performer on the Rugby – Norwich services during late July. D5080 worked the 9am Nottingham Midland - Liverpool Central on September 10th, returning with the 1.15pm to Harwich, taking this service as far as Manchester. This working was at this time, at least from Sheffield, a Brittania turn. The Southern Region still operated a Glasgow - Newhaven car-sleeper, being frequently worked by BR/Sulzer Peak and English Electric Type 4s, though both classes were banned from the diversionary route between Herne Hill & Tulse Hill. D181 on July 8th did use that route following blockage of the proper route through Clapham, however on 10th when the diversionary route was again required D5023 & D5080 were diagrammed for the train. Condition September: green livery with small yellow warning panel, curved upper corners, bottom of warning panels partially coveres frame level stripe, blanking plates fitted, valencing still present, hand/footholds in place, engine exhaust in original position, ridge sided sandboxes, three rung bogie mounted footsteps. Condition date uncertain: blue & yellow livery, shortened fuel & water tanks, both with circular gauges, no blanking plates, valencing still present, hand/footholds in place, exhaust located over engine room, BR emblems on each cabside, number inboard of cab doors with 'D' prefix. The investiture of the Prince of Wales at Caernarvon created much special traffic for the region, including the use of Class 40s 216 & 233 on the Royal Train. The only recorded use of a BR/Sulzer Type 2 was the stationing of 5080 at Caernarvon as a shunting locomotive! On March 6th the WCML at Stafford sustained serious delays when 5080 hauling three tankers caught fire. This led to the power being switched off with major delays on both sides of the obstruction. 151 assisted E3118 into Wolverhampton High Level where the Peak ran round and took the train on to Crewe via Shrewsbury, running about two hours late, power was finally restored about 10.30pm. 5080 had reached Derby Works by April for repairs. On August 9th a Rotherham - Aberystwyth day excursion saw Class 47 No.1531 work the Rotherham - Shrewsbury legs whilst 5080 & 5135 took over for the round trip to Aberystwyth. On September 3rd 5080 was noted at Cardiff having worked the 07.35 from Shrewsbury. Condition September: blue/yellow livery, shortened fuel and water tanks, both with circular gauges, valencing in place apart from above the batteries, no blanking plates, hand/footholds plated over, exhaust located over engine room. On June 27th a Northampton - Pwllheli day excursion saw 5080 & 5081 work the roundtrip Shrewsbury - Pwllheli portion. On January 22nd 5080 was noted on the WCML at Acton Bridge hauling Class 47s Nos.1836 & 1839 for Crewe Works, 1836 had sustained considerable collision damage. On April 8th a Crewe – Pwllheli enthusiast special started out behind 5056 & 5062. At Welshpool 5080 replaced an ailing 5056, which quickly headed back towards Shrewsbury, complete with the Welshpool – Newton “staff” still onboard! The locomotive was finally stopped at Westbury and promptly reversed course back to Welshpool, where the special finally got away over an hour late. Condition November: blue/yellow livery, gangway doors present, shortened fuel and water tanks, both with circular gauges, valencing mostly in place apart from above the batteries, blanking plates fitted, hand/footholds plated over, exhaust located over engine room, straight sided sandboxes, three-rung bogie mounted footsteps. Final condition: similar to September 1972 condition except gangway doors sheeted over, blanking plates fitted, boiler water tank and buffer beam steam pipe removed. Page created May 21st 2016. Last updated September 30th 2018.